Hugs to everyone who left such lovely, supportive comments and wishes during my recent horribulus two months. VERY Much appreciated. Bless you! 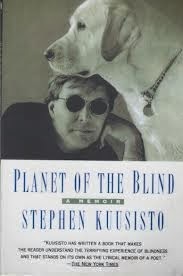 I have been re-reading Stephen Kuusisto's Planet of the Blind. It's not often I re-read novels and the second time has been as enjoyable and rewarding as the first. A wealth of description and showing which is a real treat. My mother is now in a nursing home 200 miles away from me and I, it seems, must learn to let go. It's a chance for me to get back to my life and get on with things again. It has been a very tumultuous time for so many reasons, but I keep reminding myself that what doesn't kill us makes us stronger. I hope the past two months have made you all stronger.